AUD/NZD is on bid near 1.0350 during early Monday. In spite of registering gradual recovery since Wednesday, the quote couldn’t surpass 1.0360 horizontal-resistance nearing March 06 low and highs marked during March 08 and 11. However, an upward sloping trend-line connecting Thursday and Friday’s low, at 1.0340, portrays the buyers’ power. 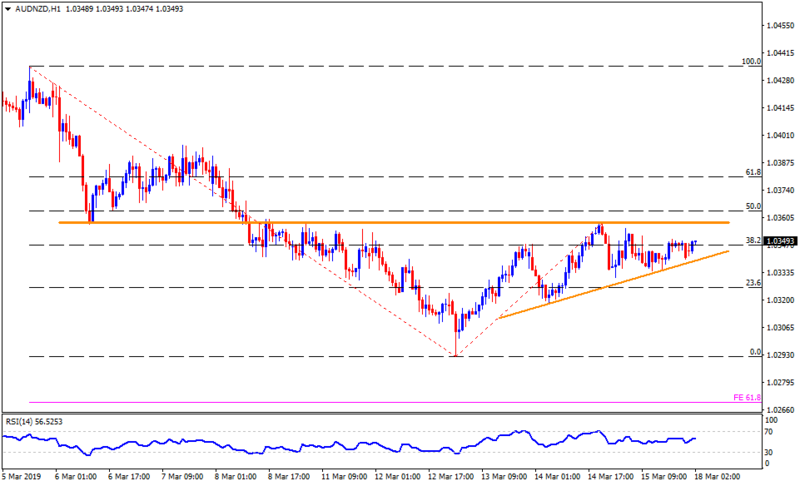 Should the quote manage to surpass 1.0360, it can quickly rush through 1.0380 in order to aim for 1.0400 resistance. Also, sustained advances past-1.0400 may help pair to aim for 1.0420 and 1.0435 north-side numbers. On the flipside, pair’s dip beneath 1.0340 support line can recall 1.0320 and 1.03000 levels on the chart whereas 1.0290 could challenge the sellers afterward. In a case prices continue sliding under 1.0290, 61.8% Fibonacci expansion of its moves from March 05 to 14, at 1.0270, can please bears.